Get the best of both worlds with flowers and jewelry! 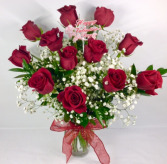 Send this single premium red rose with a mixture of textured greenery, like seeded and spiral eucalyptus and ruscus. 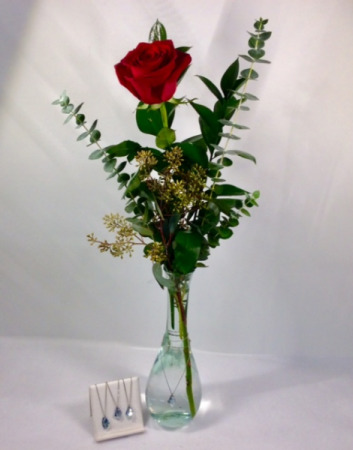 It is adorned with a genuine Swarovski crystal necklace around the neck of the glass vase for that special touch! 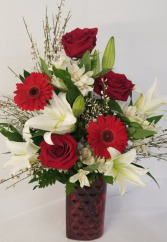 Really show your love and admiration with this romantic arrangement in a red glass vase filled with 3 premium red roses and babies breath. 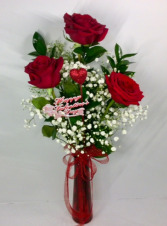 It is adorned with a glittery bow and heart and a "Happy Valentine's Day" pick.